Alex’s christening is taking place at the end of the month, and one of the main things on my agenda has been to sort out his little outfit for the day. For Becky’s christening four years ago, this was a really easy task – there are so many lovely christening and special occasion dresses for girls out there, and I fell instantly in love with a gorgeous silk Mamas & Papas one. I just added a little hair band and some cute socks and booties, and she was ready for her big day. Unfortunately, I’ve been struggling a bit more with Alex’s outfit. I’ve looked at lots of specialist christening brands, including the likes of Rachel Riley, Angels and Fishes, Emile et Rose, Adore Baby, Little Darlings and so on, as well as special occasion ranges in John Lewis, Next, Debenhams, M&S and Not On The High Street, and I’ll be honest, I didn’t like any. They were either too classic for my taste, or too much down the sailor outfit route, none of which I’m keen on. I also don’t really want an all-white outfit, because I think boys look a bit strange, and let’s face it, we wouldn’t even make it to the Church without instantly getting stains on it. Then there’s the traditional christening gowns a la Prince George, but again, I think boys look a bit funny in those anyway, and if anything, only really newborns or small babies can get away with it. But Alex is one year old already, so I feel I had to find an outfit that was more suited to a toddler than a small baby. 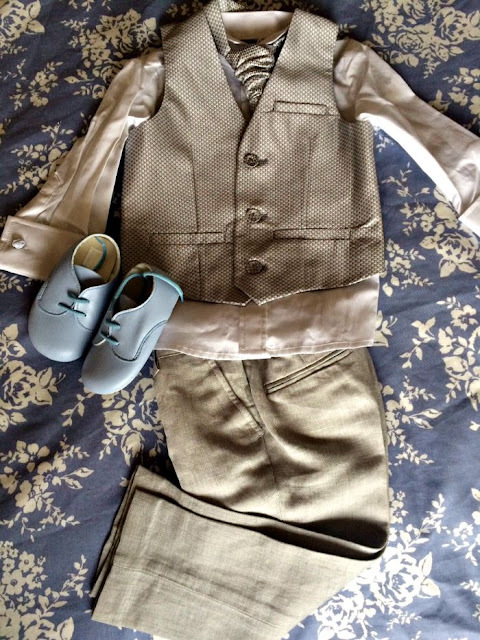 Also, there is the small but important detail of cost – most of the proper christening outfits are quite expensive, and I don’t really want to invest this much in something that he will, realistically, only wear for a couple of hours before I have to change him into his comfy joggers and tees. So, after a lot of looking around and hours spent on t’interweb (my favourite past time – online shopping!) I ended up buying a little combo from Monsoon consisting of a white shirt and a lovely silver grey vest and cravat (we’ll see how long that one will stay on for! I hope at least until after the ceremony!). Sadly, they didn’t sell any matching trousers with this, but I found a lovely pair of silver grey linen trousers from Next, which I have teamed with the cravat set. To finish off the outfit, I also ordered some very cute pram shoes from Baypods, as Alex is not walking yet, but just turning up in socks or nothing on his feet seemed a bit odd, too. I bought them in light blue, as I thought it would create a nice but subtle contrast whilst still being a light colour to match the occasion, and I can still use them afterwards. I am in two minds whether I should have bought a white pair instead though, looking at the outfit put together, but then again, I probably would never put Alex in white booties again. We’ll see. I still have over a week to order another pair if I do change my mind. So this is it, my little boy’s outfit for his big day. I’m really looking forward to it now, the closer it’s getting. It will be a very small and private affair, but hopefully we’ll all have a lovely time and celebrate our gorgeous boy.